Is it possible that outdoor hockey is more popular in the USA than it is in Canada? 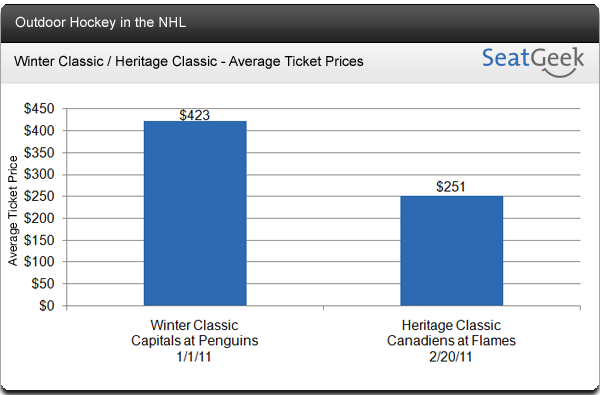 Ticket prices of the Winter Classic compared to the Heritage Classic show that this might actually be the case. The Heritage Classic is the second installment of outdoor hockey this NHL season. The Pittsburgh Penguins and the Washington Capitals faced off against one another on New Years at Heinz Field in front of an enormous crowd of approximately 68,000. Ticket prices for the Winter Classic were through the roof, averaging $423 per ticket. This coming weekend, the Montreal Canadiens will take on the Calgary Flames outdoors at McMahon Stadium in front of a crowd of around 38,000. Heritage Classic tickets are definitely not cheap at an average price $251 a piece, 130% more expensive than the average Flames home game, but only 69% of the cost of a ticket to the Winter Classic. As of today, tickets for the Heritage Classic are not even sold out and Heritage Classic tickets are available on SeatGeek for less than face value. So what does this all boil down to? Watching a live outdoor NHL game is more popular in the USA than it is in Canada.